Mrs W recently asked if we could help with her garden as it had gotten a bit out of control whilst she has been unable to tackle it her self. On a very hot afternoon in July we were able to get a team of three volunteers to spend a couple of hours each on weeding, pruning and generally tidying up. 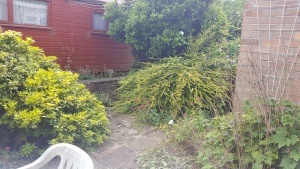 Whilst we have not been able to do everything for her we have made a big start and as you can see from this view of before and after in one part of the garden we tackled, it has made a big difference. 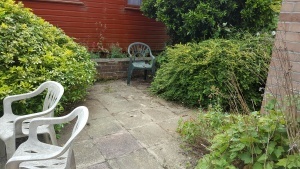 In addition to what you can see we were able to remove a big patch of nettles, prune back a plum tree which was overgrowing the drive and pavement and tidy up the weeds growing through the slabs forming the drive.